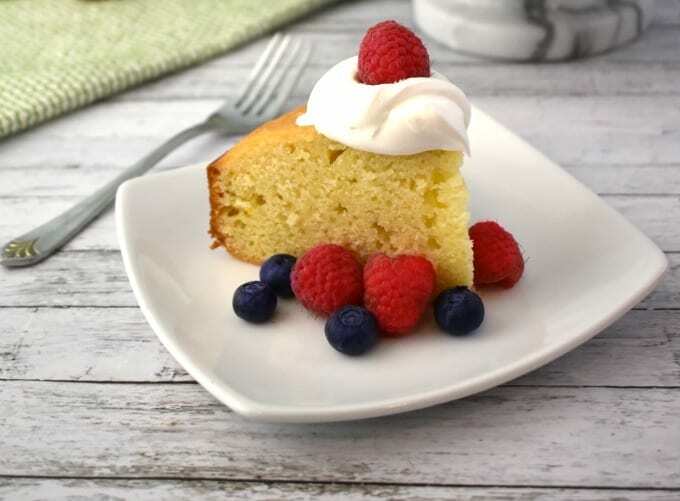 Yogurt Cake topped with homemade whipped cream and fresh berries is the perfect dessert component for brunch. Moist and flavorful Yogurt Cake makes for the perfect finish to brunch. I am in love with this fabulous yogurt cake. This is not an overly sweet, but it has really complex flavors. It has just a hint of orange by using both freshly squeezed orange juice and orange zest. The combination of this subtle orange flavor, with the yogurt is divine! 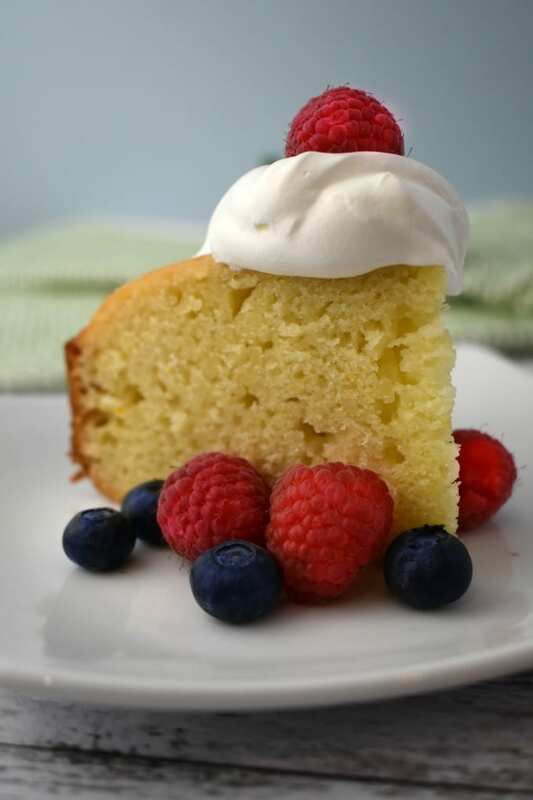 Our yogurt cake is a great addition to brunch served with freshly made whipped cream and fresh berries. What Kind of Yogurt is Best? 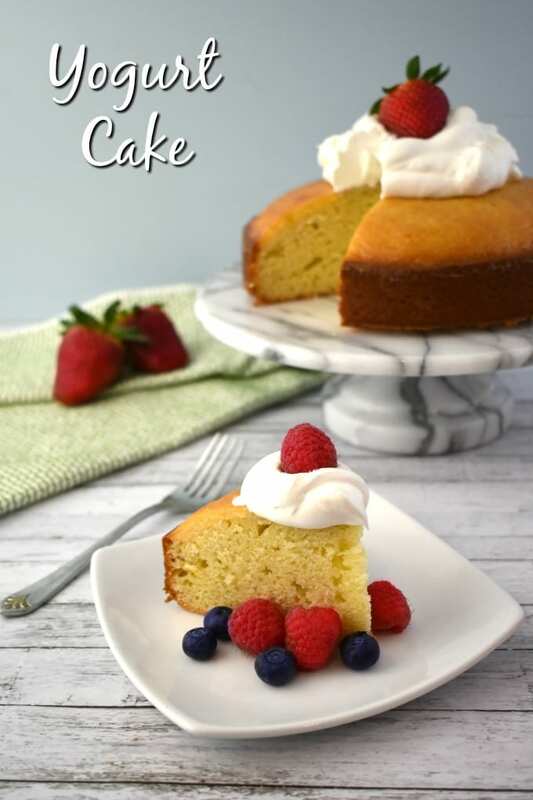 For this yogurt cake recipe, I use Vanilla Whole Milk Yogurt from Stonyfield Organic. 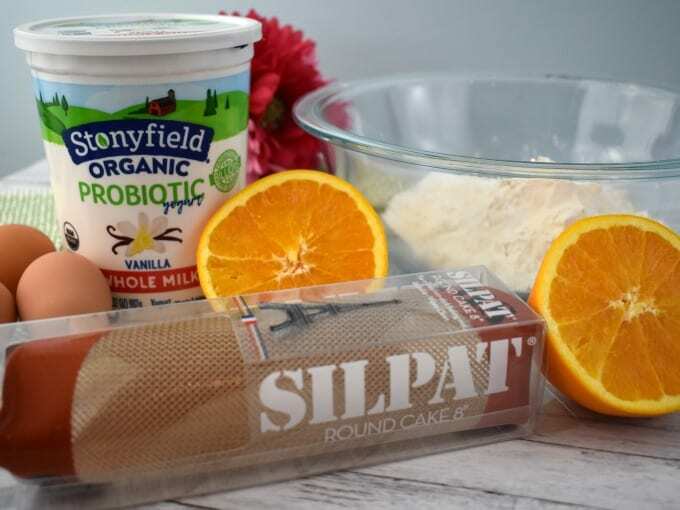 You can also use plain yogurt, but I love the subtle combination of the vanilla and orange together in this yogurt cake. 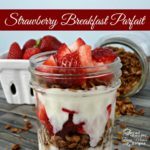 I love the quality of Stonyfield Yogurt! Does Yogurt Make Cake Moist? 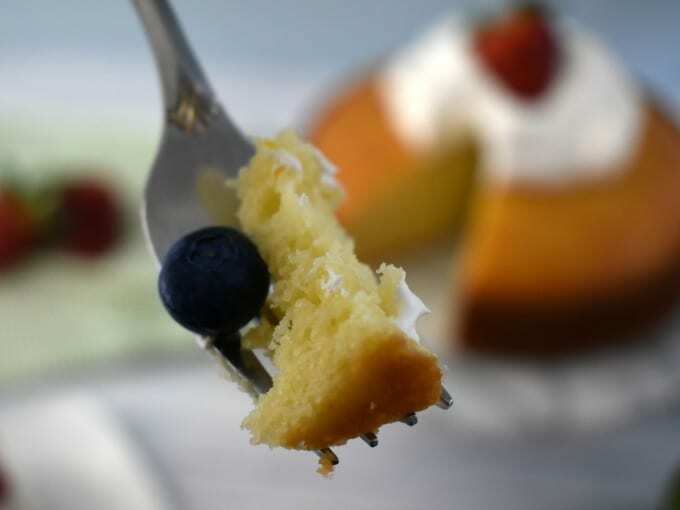 The key to a soft moist cake is the fat that you add to it, such as butter, oil, sour cream or yogurt. The acidity in the yogurt also helps the cake to rise. 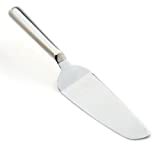 Preheat the oven to 350-degrees F. Prepare a deep 8″ round cake pan with an 8″ round Silpat mat by greasing and flouring. In a medium mixing bowl, sift the flour, baking powder and salt. 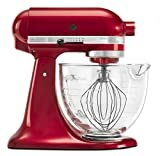 In an electric mixer fitted with the whisk attachment, combine the vanilla yogurt, granulated sugar eggs, orange zest, vanilla extract and orange juice. With the mixer on low, slowly add the flour mixture to the wet ingredients. Remove the bowl from the mixer and use a spoonula to fold the oil into the batter. Pour the batter into the prepared pan and bake for 50 minutes, or until a toothpick inserted into the middle of the cake comes out clean. Set onto a cooling rack for 10 minutes before turning out to cool completely. Top with homemade whipped cream and fresh berries. 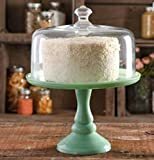 How Do I Keep My Cake From Sticking? Parchment paper cut into a circle will work, but I prefer to use a Silpat 8" round mat to keep the cake from sticking. Grease and flour the sides of the pan as an extra precaution. This yogurt cake recipe is one you’ll want to make again and again because it’s just so delicious! Our yogurt cake with a hint of orange is so amazing that everyone will want seconds! Prepare a deep 8" round cake pan with an 8" round Silpat mat by greasing and flouring. With the mixer on low, slowly add the flour mixture to the wet ingredients.Remove the bowl from the mixer and use a spoonula to fold the oil into the batter. Yogurt Cake with a hint of orange is the perfect dessert component for brunch. Because we test all our recipes, we recommend that you make them once just as it is without substitutions or changes. Sometimes variations can go awry. Making our yogurt cake recipe as we have tested it will yield the best results. If you really want to get creative, here are some ideas for variations that might work well. (Please note, we have not tested these variations). Substitute lemon zest and juice instead of orange zest and juice. Drizzle a simple glaze made with a mixture of powdered sugar, milk and orange zest instead of whipped cream. 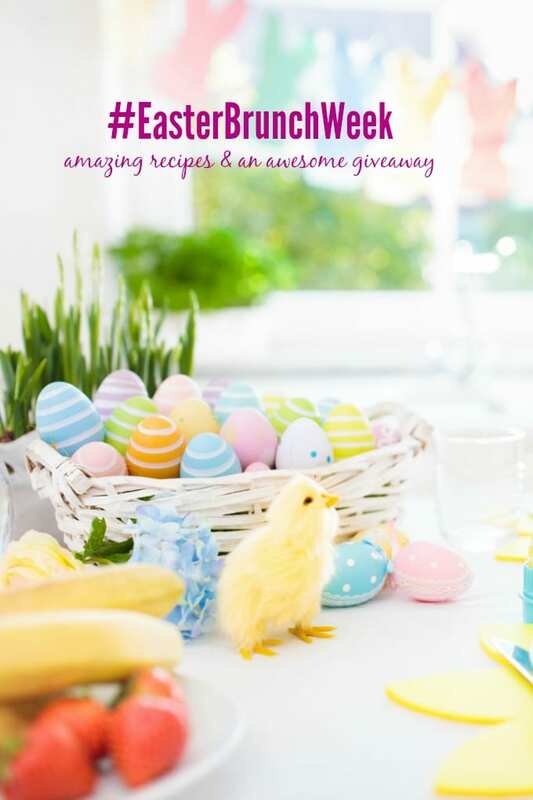 Our Easter meal is traditionally done in the evening – and there is usually ham, broccoli casserole, mac and cheese, and many different salads. Delicious! I always make lemon squares. Our family tradition is always carrot cake! Can’t go wrong with cream cheese and carrots! It’s so hard when family dynamics change and traditions are lost. Thank you so much for taking the time to comment here Cathy. I really love hearing from my readers! 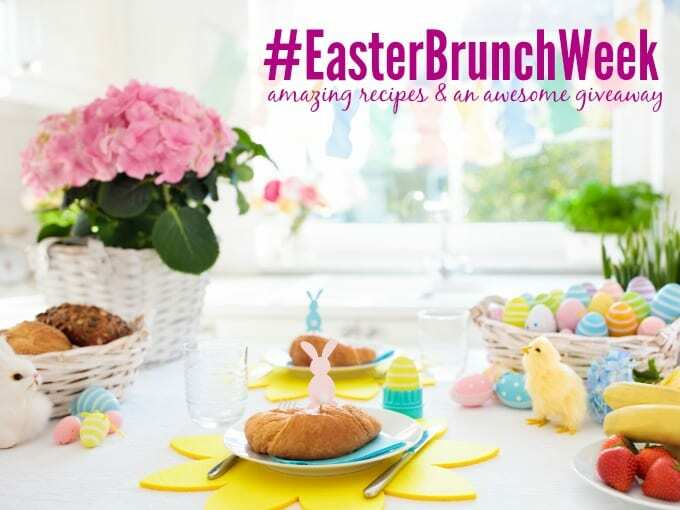 Easter breakfast in our family has always been creamed eggs on toast – a good way to use some of those hard-boiled eggs! I like to add a little curry powder to the cream sauce. For the main meal, I prefer lamb but sometimes make ham depending on what deals I find. I make ham, potato salad, pickled eggs, mashed potatoes and a veggie. This lemon yogurt cake looks delicious and I can’t wait to try it. A traditional Easter meal for us just simple meal with ham as the main course. Thank you Linda! Good luck and thank you for stopping by! I usually make deviled eggs and a broccoli salad. One of our favorite Easter dishes is raspberry pretzel jello salad. We usually have ham, funeral potatoes, vegetables, and other sides as well. Deviled eggs are a must for Easter. My family LOVES my mother’s recipe for rice pudding, so that’s always on the Easter menu. I always make a lemon cake and a side dish with asparagus for Easter. On Easter, we tend to cook: ham, mashed poatatoes, sweet potato casserole, peans, green beans, corn, biscuits, peach pie, ricotta pie, and pecan pie. I usually make a cake. Breakfast I’ll make monkey bread or a coffee cake. Monkey bread is so yummy! Thanks for stopping by Adina! We usually have ham, potatoes, veggies, deviled eggs, and rolls. I also make a cake or fudge for dessert. It’s a great excuse to make lamb! Hubby loves ham, and we usually have the loaded potato bake. Love to make lemon bars also. This cake looks delicious. Can’t wait to try it! I hope you get a chance to make it soon Tamara! Never have a regular a regular plan for Easter. Just search online for something different to try. 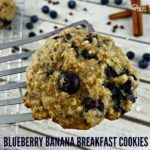 I think it’s so fun coming up with new recipes to try! I like to make a baked ham, scalloped potatoes and a lemon cake. What’s not to love about that?! Thanks for visiting Mia! We don’t really do a big Easter meal anymore, but I do love making a vanilla pound cake! Ham with pineapple and clove spikes and cheesy potato bake. For dessert I like to make an Easter themed treat i.e., cake decorated like a basket with a handle and green coconut “grass” and scattered with jelly beans and mini peeps; a cake shaped like a decorated Easter egg; a cake shaped like a lamb it’s a coconut “coat”; a bunny shaped caked with chocolate frosting. We have ham and a coconut Easter cake shaped like a rabbit. Of course we have deviled eggs too! My grandmother used to make cakes like that! What a sweet memory, thank you! I so appreciate you stopping by Susan! 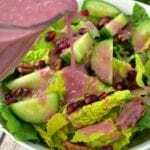 I like to have a Ham, green beans, potato salad, and a great dessert! We also have candy and decorated boiled eggs! We do a small ham and 2 meatloaf and glazed carrots. Others bring the rest of the sides. We usually have ham, cheesy potatoes, some kind of vegetables (it varies each year) and then either pie or cheesecake for dessert. Our Easter meal consists of a spiral ham, mashed potatoes, green beans, grand mariner carrots, tossed salas, warm rolls and a few Polish treats! We all love pierogis and a special Easter smoked keilbasa, as well as a fresh keilbasa. Since we go to church It does not leave alot of time for cooking. We have Ham, mashed sweet potatoes, a vegatable and some kind of dessert. I always try to cook the ham different ways to not be so boring. I usually make some type of cake with pastel colors! I love adding Easter candy, like little chocolate eggs on top or even Peeps! Easter is probably my favorite holiday to bake for! I have a turkey breast I’m going to make and pair with a couple of sides, i know one side will be roasted sweet potatoes and maybe Brussel sprouts with dried cherries or something else and dessert is between a carrot cake with white chocolate frosting or a white chocolate cheesecake. I like to make lemon blueberry cake for Easter. Scalloped potatoes & pecan pie are must haves. I normally make a pineapple upside down cake! I love it! Thanks for stopping by Jeanine! It tends to differ what we make. But an example would be… Ham, Mashed Potatoes, Green Bean Casserole, Salad, Rolls, and some kind of dessert. 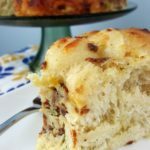 I make ham, scalloped potatoes and a Traditional Bunny Cake! My family has been making the Bunny Face Cake for over 50 years! We started doing brunch for Easter a few years back and we enjoy it much better. We make a french toast bake, a spiral ham, eggs (Benedict), fresh fruit salad and then whatever else we decide to add. We tend to go traditional and make ham, mashed potatoes,bread, salad, and some desserts like fruits, pies,etc. I usually only make desert type recipes for Easter. I make veggies and ham. My big thing is candy, I make a large tray of candy all sorts, creams, crunchy and chocolates. I also make cakes & cupcakes, coconut, carrot, all flavors of cupcakes and a large bunny cake. We have a large family that gathers for our Easter feast and we enjoy eating. I always make Rum Buns and I always make Deviled Eggs, other then that my menu varies!! Oh! Never heard of rum buns but they sound amazing! We really don’t have any specific Easter Dinner traditions. I basically ask my husband what he would like and fix that. He’s usually pretty traditional, though. I make scalloped potatoes as a side for the Easter ham and carrot cake for dessert. I try to switch up our main and make all the sides the kids love. I always make cheesecake for Easter. It is a tradition. I make a ham dinner with sweet potatoes with pineapple and oranges in it, baked mac and cheese, other sides and whatever desserts I have time to make. I adore mac and cheese! I bake carrot cake for Easter. I make the mashed potatoes, rolls, and macaroni and cheese for our family celebration. We go to my SIL’s house and she keeps asking for my potato rolls, so that’s what I bring. Last holiday I got to make applesauce, too, which everyone liked. Four kinds of apples and several spices, which made it a bit more exciting that store bought. Well, I’m gonna try that yogurt cake for myself, after I get the potato rolls out of the way. 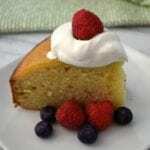 I hope you enjoy the yogurt cake, it is SO good! Traditional Easter Dinner- Ham, Greens, Mac&Cheese, Corn on the Cob, Deviled Eggs, Rolls, Cherry Cheesecake, German Chocolate Cake. Celebrate and enjoy the feast with family and friends.